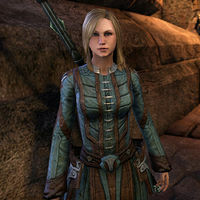 Gabrielle Benele is a member of the Mages Guild first encountered in Glenumbra when she helps fight back against Angof. She can later be found helping King Fahara'jad in Alik'r and Queen Arzhela in Bangkorai. She is part of the invasion force that enters Coldharbour. She is also the author of several books. Gabrielle can be found on the second floor of the Anvil Mages Guild poring over a pile of books in an attempt to figure out what happened to Darien Gautier after the Coldharbour invasion. If you have found the note signed with Darien's name in Wrothgar, you can tell Gabrielle about it, and how he might have ended up trapped in the Colored Rooms. She lights up at the news, saying she'll now look for a way to bring him back, now that she knows where he is. Gabrielle can be first be encountered in a crypt beneath the ruins of Merovec's Folly when you have asked to find her. "I hate meeting new people when I'm not at my best. Is my hair all right? Are my robes on straight?" Commander Ales sent me to help you. "Commander Ales? A good man and a good soldier. But how did you find me?" You left your journal at the camp. "I did? I knew I left my journal somewhere. But I haven't told you the most exciting news! I found the Midnight Talisman. With it, we can punch a hole in Angof's barrier at Cath Bedraud. We just need to recharge the beautiful little relic." "Do you like the name? I thought it up myself. Sounds simply ominous, doesn't it? Anyhow, it's a Daedric relic used to manipulate Oblivion portals. If you know how you can use the talisman to get past arcane barriers. So this talisman is the key to defeating Angof? "The talisman would be the key to defeating Angof—if its power wasn't depleted. We need to recharge the talisman. Then we'll finally get our chance to deal with Angof and take the battle to him! Immediately after you can help her recharge the talisman. "I have a ritual that can recharge the talisman and restore its power. There's an ancient Wyrd site on the beach near here. We can use that as the focus for the ritual." You're injured. Can you travel? "I just need to rest for a bit. Then I can get myself there and still have enough power for the ritual. Here, take the talisman and head on down. I'll meet you there." I'll meet you at the ritual site. Before leaving for the beach, you can speak with her again. "Take the path down to the beach. I'm too weak to walk, so I'll use my magic and meet you there." Once you have arrived at the site, she will have already teleported there. "You made it. No zombie bites or anything." Can you explain what we're about to do? "I found an inscription in the crypt. It described the relic in remarkable detail. Apparently, the talisman can draw energy from the land itself. Ancient magic saturates this site. It's the perfect place to perform the ritual of recharging!" "I perform the ritual. You stand there and look heroic. Simple? Gabrielle Benele: "Here goes nothing." Gabrielle Benele: "It's done! But something's not right." You can ask her what is wrong. "The ritual worked, but something … well, something awful looked at me while I was channeling energy into the relic. I think there's something trapped inside the talisman." There's something inside the talisman? "Whatever's inside the relic, it's certainly not friendly. We can try to dispel it using the Wyrd revelation stone in the circle just up the beach. Put the talisman on the stone and kill whatever emerges. That will do the trick." I'll kill it. What about you? "Just handle getting down here tired me out more than it should have. I known you can handle whatever's inside the talisman. I'm pretty sure it's just a banekin or a lesser scamp." Put the talisman on the stone and kill what comes out. Got it. "The circle is just northeast of here, up the trail along the beach. Place the talisman in the revelation pool. That should force whatever's inside to come out." Once the Daedric entity has been purged from the talisman, Gabrielle will arrive to see the tail end of the fight. Gabrielle Benele: "You did it! Wings of Akatosh, what was that thing?" She will then apologize for underestimating the entity within the talisman. "Julianos! I was wrong about how powerful thing in the talisman was. My apologies." It was a Dremora. Is the talisman all right? "Dremora? Oh, those are bad. Sorry. At least it's gone and we can use the talisman now. I have enough energy to open a portal for both of us to use. Are you ready to return to the redoubt?" Gabrielle will want to speak with you once you have returned to the Lion Guard Redoubt. "This is it. All out work has led to this." "We're ready to confront Angof and destroy him. Thanks to you, he won't be able to hide from us now. I told Sir Lanis what happened out there. You should introduce yourself when you get a chance." "Angof the Gravesinger is as good as dead. Or is he already dead? Or undead? Anyway, this is almost over." Gabrielle will arrive in the Cath Bedraud graveyard once you have returned to Darien after finding enough Bloodthorn Amulets. "These soldiers won't last much longer and I don't have enough magic to extend my ward to protect them. Darien told me about the amulets. Did you get them? With any luck, they'll work like the talisman you're carrying." Here are the amulets I acquired. "Perfect. Thank you. I'll put them on the wounded knights and Darien can lead them to safety. Do you have any more? I might be able to use them to clear the mist. Yes, I collected a few extra amulets. "If I merge them and cast an amplification spell I can increase the size of my protection ward. If I can get to a central point and hold the spell long enough, our troops will be able to get in. You just need to defend me while I do it." "Good. Meet me at the center of the graveyard. When Angof notices what I'm doing, he's bound to send someone to stop me. If they interrupt me while I'm casting, the spell will fail. And that won't be good." Once at the center of Cath Bedraud Gabrielle will be ready to perform her ritual. Gabrielle Benele:"Quickly now, before Angof knows we're here." You can speak with her when you are ready to begin. Remember that I can't defend myself while I'm performing the ritual. You have to protect me." "Stay close. You need them off me until I finish." Gabrielle Benele:"Stay close. You have to keep them away from me until I complete the ritual." Gabrielle Benele: "We did it! Come one. Let's get inside before anything else tries to stop us!" Before you enter you will need to speak with her. "That takes care of the mist, but who knows for how long? Let's not waste this opportunity. The time to strike at Angof has arrived." "I'll follow you as soon as the soldiers get here. Oh! Even better! Take this binding stone. Find a secure location inside the catacombs and use it to call me to you. I'll even bring some of the soldiers with me!" How will I know if a location is secure? "Some of the dead were protected by wards designed to prevent desecration. Look for a tomb with these wards and use the stone there. That should be safe enough for my purposes." I'll summon you once I locate one of the wards. "Go on. Through the portal with you. There's no time to waste." Once inside the Cath Bedraud Catatombs Gabrielle can be found nearby and she will quickly realize that something has gone wrong. "Good, you found the perfect spot for …. Wait, where are the others?" "Yes. Sir Lanis and his knights volunteered to come with me, but I only see Dame Alexine. There must have been too many of us for the binding stone. This isn't good. The other knights could have been scattered throughout the crypts." I'll look for the missing knights on my way to face Angof. "Good. But listen—there's only one way to get out of these crypts. You have to kill Angof. I don't have any other way to deal with his various protections and defenses now that I'm down here. He dies or we never leave. Those are our choices." Gabrielle Benele:"We'll do what we can to help. Just stay away from his vines." "We'll stop him, I'm sure of it. Keep away from those thorns and you'll be fine." While fighting Angof the Gravesinger, she will create magical shields to protect you. Gabrielle Benele: "Get to the light, before his magic destroys you!" Gabrielle Benele: "You did it. Now hurry! Through the portal you go!" After escaping back to the Lion Guard Redoubt she will want to welcome you back. "The others have all collapsed in their tents. They're exhausted! But I wanted to welcome you back. And Sir Lanis wants to talk to you. He's telling the Lion Guard commander what happened." What does Sir Lanis want? "Who knows? Maybe he wants to give you a medal or something. Well, go on. We'll be fine. I promise." After speaking with the commander, Gabrielle will have a final goodbye for you before you move on. "We've been through quite a bit together, haven't we? If you ever pass this way again, feel free to stop by and visit. I can think of a few other rituals that you can help me with, if you're interested." After arriving in Sentinel, you can meet Gabrielle again on on the top floor of the Sentinel Mages Guild. She won't remember Angof's name but she will be pleased to see you. "Hey——I know you! We broke into Cath Bedraud together, killed that crazy old necromancer, Angrad, er … Angolf ….What was his name again? I guess it doesn't matter now that he's dead. Ha! Good to see you!" During The Impervious Vault, King Fahara'jad sends you to Gabrielle for her assistance to break into the vault. "Hey——I know you! We killed that crazy old necromancer together——Angof. Remember the midnight talisman we used to break into Cath Bedraud? I still can't believe that worked. So I don't suppose you need help with something fun like that?" King Faraha'jad needs help to break into the Impervious Vault. "Are you joking? I've been wanting to take a crack at that place ever since I heard the name. Wait a minute——did Simone put you up to this? Why would the king want to break into the vault?" It's true. Necromancers are trying to steal the Ansei Wards. "Necromancers? Ansei Wards? Fascinating! Count me in. So we just need to break the seal? Hmm … I know. Let's try this. Go to the bazaar and get Flame Stalk from Lucienne and Worm's Head from Neenebah(sic). Then meet me at the vault. This … could work." "Go on now. I can't just twirl my staff and tell the Impervious Vault to open up. I need those reagents. Hurry. I'll meet you at the vault." Once the required reagents are collected, Gabrielle can be found outside the vault. "Aha! Perfect! Say though, you didn't happen to pick up a few giant's toes while you were at the bazaar, did you?" No, but I have the other reagents you asked for. "That's fine. Giant's toes could make a bigger gap in the seal, but they're probably hard to find here anyways. These should do the trick … I think. Hmm. Worm's Head on top of the Flame Stalk or Flame Stalk inside the Worm's Head?" "Oh. Absolutely. It's only one person going in anyways. Without the giant's toes, I can only open the seals so far. Of course, Fahara'jad thinks that one person should be you. He wants to talk to you first though. Go on up." Aren't you going to open the vault? "Sure. I just need a minute to think about exactly how to word this … hmm. Gada, Gada, Tobr'a...Tobr'a Tobr'a Gada …? Go on. I'll be right up." If she is spoken with again, she will still be muttering spell words, "Gada, Gada, Tobr'a … Netu … No. that can't be right." Once King Fahara'jad has been reported to, Gabrielle will begin her attempt at opening the Vault. Gabrielle Benele: "Stand back, your Majesty! I'm not sure how the Vault will react!" Gabrielle Benele: "I hope this works …"
"It worked! Go quickly. I don't know how long it will stay open!" "So it did work? It was so quiet after you went in, I worried, but seeing you now, well, I feel so proud, and relieved, of course." "Fried fire salts! This is way worse than I realized. The Withered Hand, eh? When I get back to the tower, I'll see if I have anything on them … it'll be useful when you come ask for my help again, which I'm sure you will." Gabrielle is one of the people invited down into the Impervious Vault to watch the restoration of the Ansei Wards, she is disappointed that King Fahara'jad wouldn't let her study the wards. "Hmmph! I can't believe the king's being so over-cautious. I asked to borrow one of the Ansei Wards for a few days to study it, and he flatly refused! I'm still glad you got them back, of course … we make a pretty good team, I think." Once King Fahara'jad has asked you to travel to Evermore to scope out the situation, Gabrielle can be asked open a portal to make the journey quicker. "Did I overhear correctly? Fahara'jad asked you to go to Evermore? Sounds like that place is shaping up to be a real trouble spot. I wish I could come along, but the guild's got me doing something else. Probably not nearly so interesting." Could you open a portal to Evermore for me? "Of course. That's a big city, though. Wouldn't want to drop you on top of some unfortunate merchant. How about the bridge right outside the gates …? Hmm. I've heard the [ON:Reachmen|Reachmen]] are "at the gates," but that could just be a figure of speech …?" Sure. I'll take my chances. "One portal to the gates of Evermore right here for you. Good luck. From what I've heard, you're going to need it." You heard the Reachmen are at the city gates? "Well, that's what Simone said, but she's a shameless gossip. Furthermore, she might have meant it as a figure of speech. Surely the Reachmen aren't literally "at the gate" …. At least I hope they're not, for Evermore's sake … and for yours." Why not portal me into the Mages Guild in Evermore? "Well … it's a long story. I was a novice, and there was this herd of swine. I meant to send them to Northglen, just outside Evermore, but I got a syllable wrong, and …. Anyway, I'm not allowed to open a portal into the Guild there anymore." Once Uela the Hagraven has been defeated, Gabrielle can be found in Evermore Castle leading the Mage's Guild group sent to assist Queen Arzhela during her meeting with Septima Tharn. "Surprised to see me? Sounds like I already missed some interesting experiences. A Hagraven controlling crows? I want to see that! This business has potential too. Of course, our part only comes into play if there's trouble. Let's hope there isn't." "We'll be in position above the parley site. If the Imperials try anything, we'll make sure they regret it. The three of us can cast spells to rain down fire, ice, lightning—we have it all. You'll just need to tell us where to target our spells." All right. I can handle that. "I hope so, because we're going to spread out and each cover a different area. If anyone comes, we'll call it out, but we'll wait for you to direct us." "Whenever you're ready to go to the parley site, let me know and I'll open a portal. Let's hope that creating portals is the only magic we need today." "Excellent. I'm going to open one portal directly to the parley site for the queen and the Fighters Guild members, and another to take us above. Actually, I guess we should go first. Now, which portal was which? Oh! I remember. Here we go." I'll go through the portal as soon as you open it. Once you have given the go ahead, Gabrielle will open a portal. Gabrielle Benele: "Give me a moment here. It takes a lot of energy to open a portal over this distance." Gabrielle Benele: "That should do it. Enter when ready. We'll be right behind you." After arriving at the Nchu Duabthar Threshold, Gabrielle will ask you to get into position. Gabrielle Benele: "Good! Looks like everyone ended up in the right place. Let's get to our positions." Once in the correct spot. Gabrielle Benele: "The queen should be here any moment … I hope, at least." Once in position the Queen and her Fighters Guild escorts will arrive and Queen Arzhela will have her meeting with Septima Tharn before getting ambushed by the Seventh Legion. Gabrielle Benele: "Fried fire salts! They're coming all right. Don't forget, we're looking to you to direct our spells. Don't worry about targeting over our allies. I promise, we won't fry the queen. Everyone—call them out when you see them!" Throughout the battle Gabrielle will occasionally call out when Legion reinforcements enter from the south. Gabrielle Benele: "Imperials coming from that door to the south!" Gabrielle Benele: "More from the south! Let's get them!" Gabrielle Benele: "They just keep coming! Another group from the south!" Eventually there will be a lull in the enemy waves and Gabrielle will attempt to open a portal to reach the Queen. Gabrielle Benele: "That can't be the last of them! It's a break though. I'll open a portal to get us down to the queen!" Gabrielle Benele: "My magicka is almost depleted. It's going to take all I've got to open a portal back to the palace. Be ready!" Gabrielle Benele: "The portal to Evermore … go, Your Majesty, go!" After you enter the portal back to Evermore Castle, the Queen will be concerned that no one else has come back. Once the Queen has been spoken with, Darien and Gabrielle will return as the remaining survivors. Darien Gautier: "That … could've gone better …." Gabrielle Benele: "I didn't think I had another portal in me … glad I was wrong." Queen Arzhela: "Well … at least some of us survived." "My next personal project … I'm going to figure out how to open two portals at once." At some point Gabrielle will have arrived with the reinforcements from Tamriel and can be found in The Hollow City's Mages Guildhall. If you talk with her she will be prepared for the upcoming assault. "We all knew we'd be fighting for our lives and the lives of the people of Nirn when we agreed to undertake this mission. I never expected anything different." When Vanus Galerion returns to the Mages Guild after his rescue and the breaking of The Great Shackle, Gabrielle will be one of the people to welcome him back. Gabrielle will be one of the Mages attending the war council in the Chapel of Light. If you talk to her before the meeting starts, she will be pleasantly surprised by the current level of cooperation. "The Mages Guild and Fighters Guild, working together! I never thought I'd see the day! But with you helping us, I'm sure that everything with turn out fine." Once you speak with King Dynar, the meeting will begin. Gabrielle will be one of those gathered at the Endless Stairs portal. "I never expected to be standing in Coldharbour, helping command a force of elite mages. It's every little girl's dream come true! I'm just glad you're here. We never would have gotten this far without you." After you receive your orders from Vanus, you will be required to talk to Gabrielle and Hahnin for your briefings. "The Mages Guild stands ready to do our part for this effort. I just wish I had as much confidence as Vanus Galerion. We're facing some overwhelming odds here, you know." Vanus said you would brief me on the plan. "Molag Bal is using tactics similar to what we faced in the Chasm. He's set up a portal to move his troops around quickly. As you head in to open the Labyrinth, we need you to close that portal." Why not send a full force? "King Dynar insists that the initial strike be fast and precise. He doesn't want the entire army getting in your way or causing Molag Bal to respond in kind. You've proven yourself time and time again. We have faith that you can do this." Do you want to accompany me on this mission? "Me? Really? I'd be honored. But I think you'd be better served with a fighter type right now. I'm sure we'll meet up somewhere along the way, though. I won't let the people of Nirn down." "After you disable the reinforcement portal, I'll try to catch up with you before you enter the Labyrinth. We'll stop this Planemeld together. We have to." Once you have been briefed, she will instead greet you with a reminder. "Remember, we need you to close that reinforcement portal before you unlock the Labyrinth. As long as the portal is functioning, Molag Bal has the ability to overwhelm us with Daedric forces." You can catch up with Gabrielle and her team in Molag Bal's personal library within the Labyrinth. They will be trying to get the nearby gate open. "This room is so big. I never expected the Prince to be much of a reader. But all these books! Imagine the wealth of knowledge they contain. I could spend years in here. If we didn't have more important matters to deal with, I mean." "We can't get out of this room. The door on the other side won't budge, and we haven't been able to figure out the mechanism yet." "Search around the room, I guess. Who knows? You might find something useful among the dark tomes and old fables about lusty Argonians. But I've never seen a mechanism like this before. It's rather fascinating." If you talk with her again, she will remind you. "Just look around until we figure out a way to either open that gate or get around it." After you unlock the gate she will tell you to go on ahead. "With the door opened, we can proceed deeper into the Labyrinth. Go on! We'll be right behind you." Once you make your way through the Dark Chamber, Gabrielle will catch up with you with the others. Gabrielle Benele: "With the door opened, we can proceed deeper into the Labyrinth. You can speak to her when you stop momentarily after crossing the bridge. "There's no time to rest. We have to keep moving. I'll sure our flank is protected while you clear the way ahead." When you enter the Statue Room, the door will lock behind you once you and Gabrielle enter. Gabrielle Benele: "A one-way door. Looks like we can only go forward from here. I hope the others are all right." You can talk to her before going forward. "I can't imagine we have too much farther to go. We just need to cross this region and we'll find the planar vortex in no time." "Stick close to me. There's probably something in here that wants to kill us." Gabrielle will then become your follower, as you walk through the room she will notice something. Gabrielle Benele: "There has to be a way out of here … wait a moment … something bad is about to happen …." The Fiend Statues will then awake. Gabrielle Benele: "Sometimes I hate it when I'm right. Here they come!" After you fight of the attack, Gabrielle will be determined to keep on moving. Gabrielle Benele: "Come on! We need to find a way out of here." Gabrielle Benele: "I need to get this door open. Hold them off while I work on this!" When the door is unlocked she will run on through. Gabrielle Benele: "The door's finally open! Let's go!" Once you are through the door, Cadwell and Vanus will teleport in. You can talk to Gabrielle during the brief lull in action. "That was a close call. Thanks for helping me in there. I don't know about you, but I'm really starting to dislike Daedric death traps." Gabrielle will be one of your surviving allies that Meridia brings to you through the Planar Vortex portal. You'll have a chance to talk with Gabrielle before starting the final part of the mission. Despite her losses, she will be determined to close the vortex. "I imagined that this was going to be grand adventure, but I never pictured the horror of all this. So many of our friends and companions have died, and this damn vortex still threatens our world. I think it's time we shut it down. Permanently." "Damn right I'm determined! And more than a little irritated at all this! Come on, hero, let's show Molag Bal how it's done! Then I can get back to the ordinary craziness I usually get to deal with." Do you really think we can win? "I think we can. I hope we can. All I know is we've come too far to give up now. I … I just worry that we still have a lot of fight left to go. I think more of us are going to die before this is all over." After several of the Dark Anchors are destroyed, Gabrielle will try to stay behind and buy time for the group to destroy the vortex. Darien will refuse to leave her. You and King Dynar will go ahead to place the Light only for you to be ambushed by Molag Bal's council. After you slay them, Meridia will arrive with your companions. Gabrielle and Vanus' task during this is to channel their magic into the Light of Meridia for the spell. 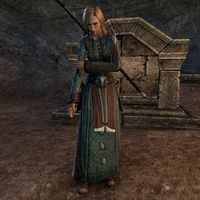 While you, Darien and King Dynar deal with the reinforcements, Meridia will soon mention that her shield is at its' limit but by then the spell will be near complete. There will be a flash of white light and you will wake up in the Chapel of Light. After talking with Meridia, a distraught Gabrielle can be found with Vanus and a dying King Dynar. When you talk to her she will be pleading with King Dynar. You can ask her what is wrong. "Please, you have to hold on. We … we can't lose any more of our companions. There's been too many deaths already." Are you all right, Gabrielle? "How can you ask me that after what we've been through? Darien … the King … so many injuries … so many deaths …." "I don't know. He wasn't here when we arrived. I … I didn't see him. When the light erupted, Vanus, Dynar, and I appeared here. No one else. Just us. I … I think Darien's gone." After you speak with King Dynar for the final time, Gabrielle will be perturbed by all the losses. "How many did we lose today? I … I can't even count. I fear going back home. Seeing who survived and who didn't. It's all just so … overwhelming …." When you meet Gabrielle in the Anvil Mages Guild, she will be busy—and annoyed—going through a big pile of books, but will nevertheless greet you by saying, "Oh, hello there! We haven't spoken since Darien … well, since that business in Coldharbour. Have we? I'm just a bit discombobulated. My mind's been somewhere else." Gabrielle? What brings you to Anvil? / What exactly are you researching? "Darien, mostly. It's always Darien who ends up causing problems, isn't it? How long has it been since we defeated Molag Bal and saved Tamriel? Sorry, time's a bit fuzzy at the moment. I've had more than a few late nights." What does you being here have to do with Darien Gautier? "I'm searching for a way to retrieve souls lost in Coldharbour or elsewhere. I'm not even sure where to start looking, but I need to start somewhere, right? Darien's out there. I know it. I just have to find him, though that's easier said than done." You think Darien's lost in Coldharbour? "Well, Darien was with us at the end, wasn't he? Facing down Molag Bal. He didn't come back, and he didn't die, so logic suggests he returned when we did. He simply came back somewhere else. I just have to figure out where. Then I can bring him back." "Dozens. Hundreds! The problem with having so many ideas is that it's like these books behind me. They just pile up, and you can't possibly read all of them. So you read what you can and try to focus. This might be why I'm not getting enough sleep." "You what? A note from Darien? How is that possible? What did it say?" The note mentioned The Colored Rooms. I think Darien was calling for help. Yes, this helps. This helps a great deal. Now I know where to look for him!" Are you here on behalf of the Mages Guild? / I'm glad. So are you here on behalf of the Mages Guild? "No, not really. This is more like independent research. 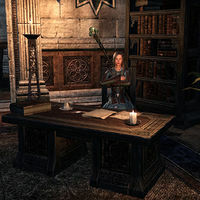 Do you know every Mages Guild in Tamriel has different books in its library? You'd think we'd standardize, or at least keep a lexicon. Also, they could really use some more bookshelves." Do you plan to be here long? "Perhaps. My sister, Sara, was supposed to meet me here, but she hasn't shown up yet. She's a week late, which is unusual for her. So organized. I hope she hasn't run into any trouble. The guild sent her to Craglorn. Not the most pleasant of places." She is the sister of Sara Benele. Before joining the Mages Guild, Gabrielle was part of the University of Gwylim. Her written works includes answering people's questions. Gabrielle was banned from the Anchor's Point Inn after an altercation with a Nord Dragonknight. She was also banned from creating a portal directly into the Evermore Mages Guild building after a separate incident. This page was last modified on 5 February 2019, at 03:53.